Natchez, Mississippi, attracts thousands of visitors annually. One look through these pages and it is easy to see why. Beautiful exterior shots, rare interior photographs, and moving descriptions capture the essence of one of the largest and best-preserved collections of antebellum architecture in the country. Natchez truly is a living museum. King’s Tavern, circa 1789, is believed to be the oldest building in Natchez and still operates as a tavern and restaurant. The stately Greek Revival Stanton Hall occupies an entire city block and is considered one of America’s finest house museums. Longwood, the largest octagonal house in the country, stands unfinished today because Northern workers stopped in their tracks and left for home at the outbreak of the Civil War. 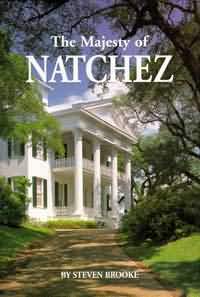 For those fortunate enough to experience this bastion of the Old South or for those who hope to visit one day, The Majesty of Natchez makes the perfect memento or gift book. It presents the grandeur of this quintessential Southern town in all its radiant splendor. Pelican’s acclaimed Majesty Series takes detailed looks at the unique architecture of historic cities and geographic areas throughout the South. 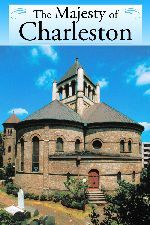 The nine titles currently in the ever-growing series include Colonial Williamsburg, Savannah, and New Orleans. Steven Brooke, an internationally acclaimed architectural photographer, received the National Honor Award for Photography from the American Institute of Architects. 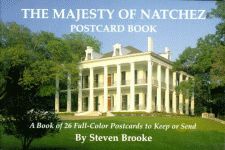 His beautiful, detailed photographs of Natchez also grace the pages of Pelican’s The Majesty of Natchez Postcard Book. His other books include Seaside and The Gardens of Florida, both published by Pelican. An adjunct professor of architectural photography and composition at the University of Miami School of Architecture, Brooke lives with his son in Miami, Florida.